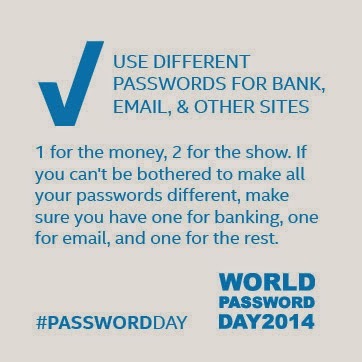 May 7 is World Password Day! One of the best things I did was to purchase a little password book that I keep by my desk. I don't think I could function without it. It helps me remember all the passwords and believe me, I need help remembering because I try to change my passwords often. There are online Password Managers, too. I've not moved to that yet though. Do you change your passwords often? If not, you should. Studies show that 90 percent of all passwords are simple enough to be hacked in seconds. There is a new website (passwordday.org) that shares a videogame that pits the player against real leaked passwords, along with simple tips and tricks for strenghtening your passwords. Also, it will update you on what sites are still impacted by the Heartbleed security flaw. I know. Changing passwords is tedious, but it is important, especially if you use WiFi at a public place. You are truly at-risk for being hacked. Never enter your password at a place with unsecured WiFi. · Any complex eight-character password can be cracked in 5.5 hours.The password “thunder showers at sunset” would take more than a million years to crack. Choose length over complexity. 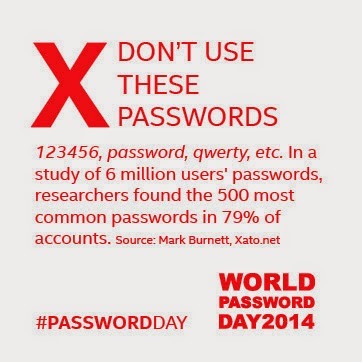 · Changing your passwords regularly significantly reduces your risk of being hacked. 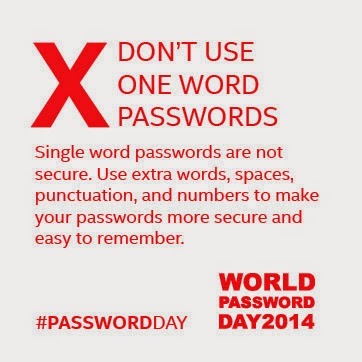 · There’s no better time than World Password Day to catch up. 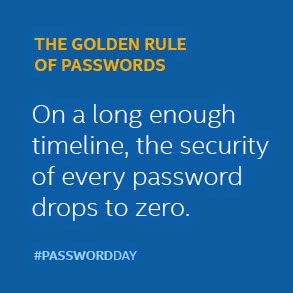 Change your password, and go from hackable to uncrackable today.